Vegan bacon made from coconut? OH YES! 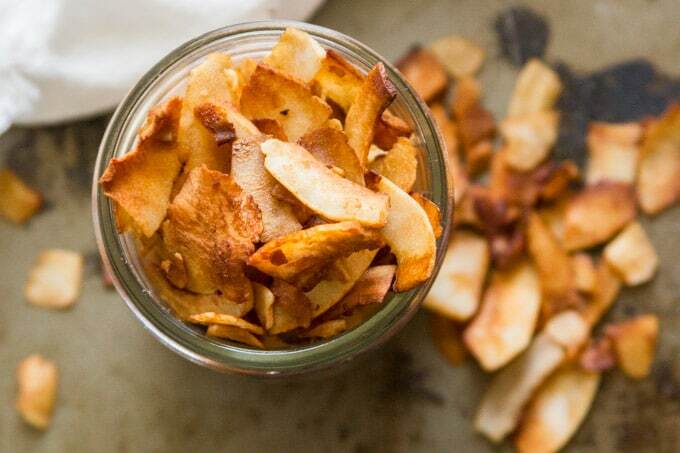 Crispy, smoky, just a tad sweet, and so amazingly delicious, you’ll never miss the real thing! This stuff will change your life. I was never a fan of bacon. In fact, it’s always weird for me when I talk to other vegetarians who tell me bacon was the toughest thing for them to give up. I always found it completely gross, from my meat-eating days as a kid, into my college years while I served breakfast to hungry tables at the local Friendly’s. The breakfast shift was my least favorite for the mere fact that the aroma of bacon continuously pumped out of the kitchen. So it was never like there was some big empty space in my heart where bacon belonged. At least until I started veganizing recipes that called for bacon and realized something was most definitely something missing. Coconut bacon has everything that I consider to be good about bacon, and none of whatever it is that turns my stomach about the real stuff. It’s crispy, smoky, salty and amazingly satisfying. I was a little concerned that the coconut flavor would overpower all of the bacony flavors, but instead it come through very subtly and surprisingly compliments the seasonings. These little flakes are the perfect substitute for bacon bits. This couldn’t be easier to make! Stir up a smoky marinade and then add your coconut and give it a gentle stir. Distribute the coconut on a baking sheet and pop it into the oven. Move the coconut bacon around every few minutes during baking so that it cooks nice and evenly. Once it’s nice and browned, take it out of the oven and let it cool. It’ll continue to crisp up as it does. 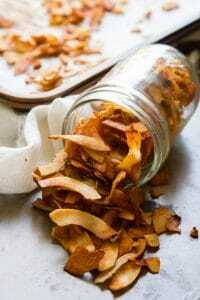 Use flaked coconut (not shredded!) to get those nice big pieces of coconut bacon like you see in the photos. Bob’s Red Mill and Let’s Do Organic brands are both good choices. And be sure to inspect the bag closely when buying: look for nice big flakes and not too many crumbs (which can be the result of coconut getting crushed during shipping). Make sure your coconut is unsweetened. Watch it like a hawk during baking. It browns very quickly and is super easy to burn. 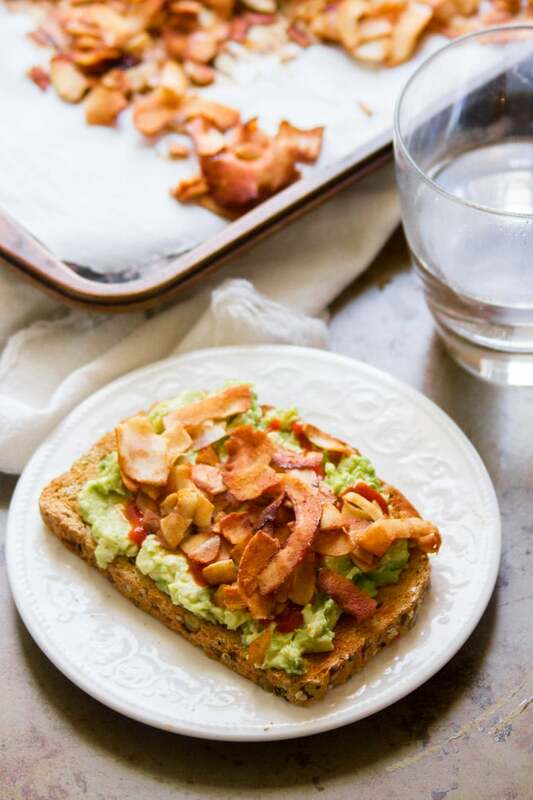 Coconut bacon is awesome on avocado toast! Check out how easy it is to make in my snazzy video! Vegan bacon made from coconut? OH YES! Crispy, smoky, just a tad sweet and so amazingly delicious, you'll never miss the real thing! In a medium-sized bowl, stir together the soy sauce or tamari, liquid smoke, maple syrup and apple cider vinegar. Add the coconut to the bowl and gently stir to coat it with the soy sauce mixture, being careful not to crush the coconut flakes. 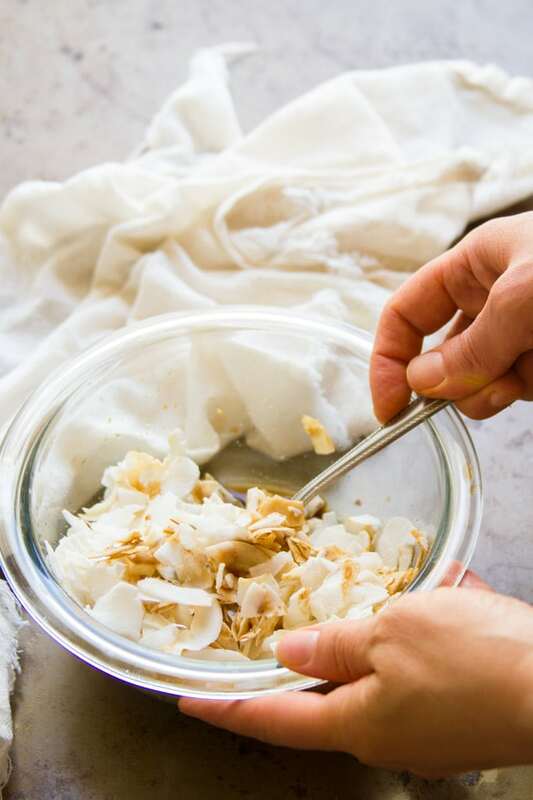 Spread the coconut in an even layer on parchment. Drizzle any excess liquid over the coconut. Bake for about 15 minutes, tossing every 3-5 minutes during cooking, until crispy and browned. Watch the coconut closely during baking, because this stuff can go from crispy to char in a very short time. Remove the baking sheet from oven and allow to cool. 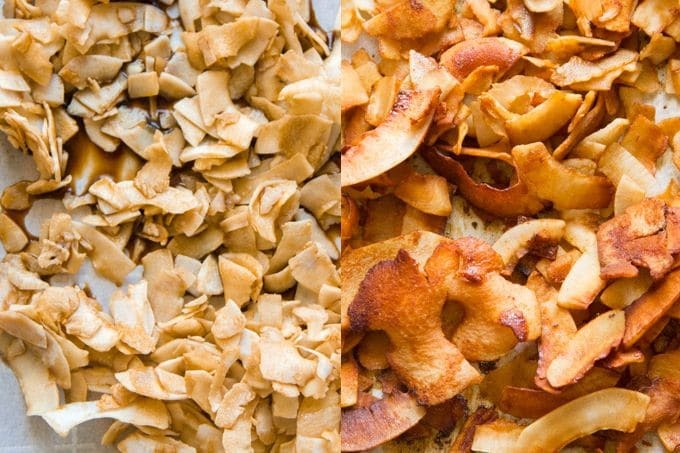 The coconut bacon will continue to crisp up as it cools. Great photos girl. I have been buying the premade bacon but I will have to try your recipe! Thanks Dawn! Enjoy and let me know how you like it!!! I just made this and I got to say the flavor is fantastic, but with that said, I don’t know how you achieved the flat big pieces cause mine came out like coconut flakes. Can you please elaborate on how you did it. Thank you, and thank you for all the great recipes in the past year. Can’t wait to see what you come up with in 2015, Best wishes for the new year. Hi Tima! Make sure you use coconut flakes, and not shreds. The pieces are much larger. Bob’s Red Mill and Let’s Do Organic both make flakes. You should be able to find these at places like Whole Foods and at some regular supermarkets, but just in case you can’t I’ve added a link in the recipe to where you can get them online. Other than that my only advise is to handle the coconut carefully when stirring, to avoid breaking too many pieces. Thanks for reading and Happy New Year! I bought mine at Costco. It was a big bag called Coconut Smiles 625 gm. They are nice size pieces and don’t break up during baking. I think I have also seen a smaller bag (not sure if same brand) at Bulk Barn. I am an avid meat-eater and do love my bacon…but coconut? 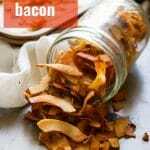 Coconut > bacon….always (I suppose it is a bit of apples and oranges here) any whoo! Are you able to omit the soy sauce? Can you use worchestshire sauce instead? I’m allergic to soy but I sooo want to make this! The soy adds a bit of savory flavor and a lot of salt. You might want to try thinning out worchestershire with a bit of water and adding some salt, though the flavor will probably be a little bit different since worchestershire has a lot more going on than soy sauce. Marmite might be another good thing to try this with. I’ve also seen some recipes online for soy sauce substitutes, though I haven’t tried any myself so I’m not sure how good they are. It might take a little trial and error. Please let me know how it works out if you try any of these options! Thanks so much for your comment!! Can’t have soy either but I’m thinking of trying this with coconut aminos. Use coconut aminos in place of soy sauce. This recipe will not be the same with Worcestershire sauce. Tamari is actually also made from soy, but would be a great substitute for anyone looking to avoid gluten. FYI Worcestershire sauce IS NOT VEGAN! There are some brands that are :) We use a brand that is vegan (doesn’t have anchovy in it) and it is a great sub for real Worcestershire in our Bloody Mary’s! Thanks, but there are actually vegan brands of worchestershire sauce, such as Annie’s and Edward & Sons. Recognizing that I have readers who are vegan, vegetarian and omnivore I generally leave it up to the individual what brand of any given ingredient suits their particular dietary needs. The original commenter did state that she’s a meat eater, so it would seem a little silly for me to try and steer her towards a vegan brand of Worchestershire sauce. Are you allergic to the gluten found in soy? if so, have you tried Tamari? it is gluten-free! Being vegetarian for my whole life I have never eaten bacon so can’t comment on whether it is a good alternative but this does look like a tasty addition to any meal. I wouldn’t recommend using wax paper. My understanding is that wax paper isn’t heat resistant and the wax can melt and transfer to your food. Of course I’ve never tried it, but better safe than sorry. Thanks for your question! I am going to try Coconut Aminos (soy sauce substitute) I can’t wait. I am severely allergic to the fumes from frying bacon (weird, yes) so I am so excited to try this. This all sounds amazing… nut there have been some serious health concerns about LIQUID SMOKE .. it has carcinogenic properties. If you wanna live healthy… would you wanna take the risk..? some brands also contain a lot of MSG. Thank you – I hadn’t heard about that and will definitely check in! Also, on side note – I did check my bottle of Wrights liquid smoke and can confirm that at least that brand doesn’t list MSG as an ingredient. Yay! Let me know how the coconut aminos work. The baconization of coconut has been a hit with hubbby because of the crispiness. I hope you enjoy it! omg these are amazing! how long do they keep? can you store them? Thank you! The longest I’ve kept this around was a week and a half in a ziplock bag, and it was still good until the end (when the last of it got eaten). That was at room temperature. I’d guess you could get at least twice that amount of time if you stuck it in the fridge. Can this recipe be used with thin sliced veggies, such as carrots, zucchini, etc. and dehydrated? That’s actually kind of an interesting idea. I don’t think they would crisp up as much, due to the lower fat content and temperature, but I bet it would still be delicious – something like smokey veggie jerky. Please let me know how it turns out if you try it! Just wondering if you could dehydrate with the same effect rather than oven back to avoid the risk of burning. You’d probably end up with something a little less crispy due to the lower temp. Baking in the oven gets the coconut just to that point of browning before you hit burning. It would probably still be delicious, but more chewy and less crispy. Thanks and please let me know how it works out for you if you try it in the dehydrator! Hello! We have a soy allergy in our family and coconut aminos became really hard to find (not to mention expensive…). We’ve adapted this recipe (rapunzel vegan boullion cube instead of the beef boullion), and it is fabulous and easy to make with ingredients we always have on hand. In case that helps anyone! Thanks for the recipe! I’m going to try it! That’s one of the recipes I was eyeing up online. Thank you for sharing! I think this will be helpful for lots of readers. Enjoy the coconut bacon!! Made some yesterday and it’s really delicious! Thanks! So glad to hear it! You’re welcome and thank you so much for sharing your results!! I made this the other day and I could still taste the coconut. what can I add more of to hide that taste some? thank you! The liquid smoke is the strongest and most predominant flavor, so upping that might disguise more of the coconut flavor. Be careful though, because it is strong and therefore easy to overdo. I’m not sure if you’ll be able to cover up the coconut flavor entirely though. If you aren’t a fan or the flavor combo isn’t doing it for you, I’d suggest trying the marinade on something else. Tempeh, tofu and mushrooms are all potential candidates, though I really like the crispiness you get by using coconut. Please let me know how it works out if you try anything different! where do you get the coconut? I bought mine at Wegmans, which is a local chain. You could probably also get it at Whole Foods or a similar store and you can definitely get it on Amazon. Just look for unsweetened flakes (as opposed to shredded coconut). The brand I used is Let’s Do Organic, but Bob’s Red Mill Makes it as well. Once I’d had the coconut club at the Memphis Taproom, I kept looking for a good method to do it myself. And finally found it here, posted by another Philly native, hooray! This turned out really well for me, thanks. I’d been thinking a club-type sandwich would be a good use for this stuff. I think that will be the next thing I try it out on. Tomato, avocado, mayo (vegan or otherwise) and coconut bacon on toast. THE BEST. It’s my new addiction. I am so trying that! That sounds delicious! 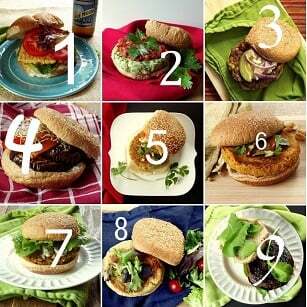 Love the avocado…I need to give that a try! Where did you get the coconut flakes. I bought the coconut at Wegmans. You could also get it at places like Whole Foods or on Amazon. Just look for unsweetened flakes as opposed to shredded and/or sweetened. Let’s Do Organic is the brand I used. OMG! I can’t do soy so I used coconut aminos and added extra salt (because coconut aminos aren’t as rich as soy/tamari) and this turned out amazing! Talk about crispy, savory goodness! Yummmmmmmmmmmmm…. I’m so excited to try these in broccoli crunch salad and on top of soups and greens! Thank you. I went in search of liquid smoke & they have different flavors hickory & mesquite. Do you recommend one over the other? I’ve always used hickory and it works great. Never tried the mesquite, but now you’ve got me curious. I’ll give that a try next time and leave a follow-up comment if I like it! I don’t know how I made it through 17 years as a vegetarian before trying coconut bacon, but this is fantastic! Even my meat-loving husband (who has been unenthusiastic about all my other favorite bacon substitutes) couldn’t stop snacking on it. This recipe will definitely make multiple return trips to my kitchen. Thank you! Finally, the last hurdle to turning my family and my own diet to vegetarian/partially vegan has been surmounted! My children and husband drool at the very mention of bacon! I hope it would be okay to share this on my (very tiny, rather new) blog. I will absolutely give you props- I adore your blog!! Thank you for all your amazing recipes! I have to say I do think like coconut. I DO NOT LIKE IT!!! However on this journey I said I would try new things. You nailed it. I’m impressed. Sooo which leads to my next question. How do you store it how long will it last? I’m glad you like it! I’ve kept it around for up to 4-5 days in a zippy bag. Do you think this could be done in an Air Fryer? I think so, but I’ve never cooked with an air fryer. Sorry! I’d love to hear how it works out if you try it! this has finally convinced me to try coconut bacon! looks so good. How do you do your nutritional facts?? It’s so amazing!! Ok so these are OUTSTANDING. I used liquid aminos in place of soy sauce and it was just fine. I made them to go on top of a big old bowl of vegan potato soup and find myself just snacking on them by themselves. AMAZING. Thank you for the recipe. Made this tonight for the first time, and it blew my mind. My fiancé and I ate almost the entire batch in one sitting. Definitely will make again. Soon!! That’s awesome!! I’m glad you both enjoyed it! Thanks Jessica! Goodness gracious! SO good! I’ve made rice paper bacon (It Doesn’t Taste Like Chicken.com recipe) which is good, but much more labor intensive than this. For better or worse, this recipe is so quick, it gives instant gratification! ;) Hard not to eat the whole batch. I had this on a sandwich at a little vegan cafe on Cape Cod, which included coconut bacon, crushed pineapple, mashed avocado, sliced tomato, sprouts, chipotle mayo on 7-grain bread. Now I can easily re-create that deliciousness. You’re right, you definitely have to keep any eye on them, because they can burn in the blink of an eye. Thanks for all your great recipes.Also a fan of your vegan mozzarella (caprese sandwich recipe) and vegan saag paneer. Mmm. Oh wow…I think I need to recreate that sandwich now! It sounds delicious! I’m so glad you enjoyed this. Thanks Karen!! I’ll be making a batch tonight! Also, I purchase all my organic nuts, dried fruit and coc flakes at nuts.com. They are the best! I’ll have to give them a try! Enjoy! !